To read the first part of Pee-Pee read it here! With embarrassment written all over my face I stared at the Kid and said, “We don’t say that in church you can ask nicely and I will give you Pee-Pee.” Again remember I had not had any coffee! To the normal person this probably sounded pretty bad that I was saying such a thing to my son. 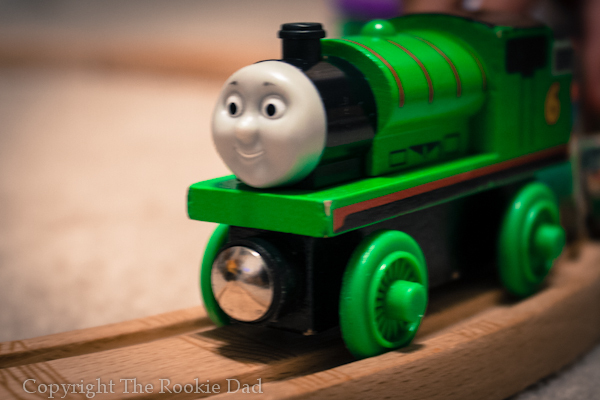 But to a parent of a train obsessed 2 year old this could only mean one thing that the Kid wanted Percy the Train. I dug through the diaper bag and pulled out a freight car. The Kid saw this and began to cry as the priest finished his sermon. Holding the Kid in one arm, I physically looked in the diaper bag unable to find Percy. The Kid looked at me with the puppy dog face whimpering “Pee-Pee” and then exploded in a full out cry! A cry so loud and obnoxious that it was to much for even the cry room at church. I picked up the diaper bag, looked at Hot Mama who can read my mind at this point in time and followed me out of church. We head out to the car unable to finish mass and loaded the Kid who is still screaming. I started to dig through my back seat pulling things from under my seat, an old coffee cup, a bottle that the Kid has not used for nearly a year, a toy car, but no Pee-Pee. Kicking and screaming we drove home. The kid ran into the house and in the middle of the living room found Percy and started to giggle and play with Percy on his tracks. I sure hope that God understands why we were unable it through church this past Sunday.